Camille Cadiz emigrated to Hawaii in 2009. After 20 years of petitioning by her grandmother, Camille, along with her parents and siblings left the Philippines in hopes of a better life in Honolulu. As she completed her degree in Culinary Arts from Leeward Community College, Camille started as an extern at Alan Wong’s Honolulu. She started as a prep cook with a single goal in mind – to improve her knife skills. “I had heard about the standards at this restaurant. Having good knife skills shows perfection and discipline to have a sharp knife all the time. It was about improving myself,” she says. After graduation, Camille stayed on and became a full-time cook, eventually moving from prep to the night line. 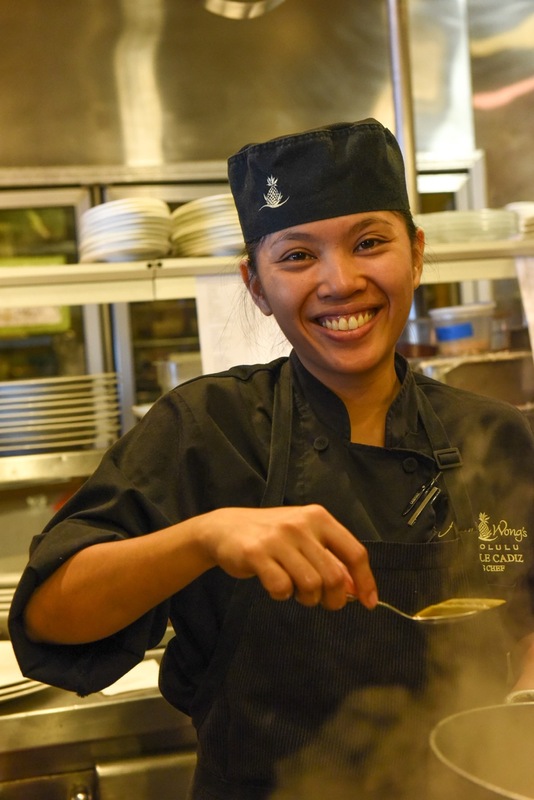 In her nearly three years with Alan Wong’s Honolulu, Camille has advanced to become an Assistant Sous Chef, and she has been a part of four Next Generation Dinners. Most recently, Camille’s solo Next Generation Dinner showcased her ability to produce her own five-course prix fixe menu inspired by her Filipino heritage. Her parents enjoyed her menu featured at Alan Wong’s flagship restaurant.